This is my little man. Tonight my husband and I took him food shopping as usual, but this time, he sat up in the shopping cart like a big boy! He is 7 months old now, and sitting up really well. 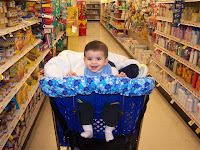 We purchased one of those quilted shopping cart inserts and it is great! Its a comfy and sanitary way to keep him happy. He LOVED it. He sat in that seat, like he was the mayor of the grocery store. He has a big silly round head and a long neck, and well, he just kept staring at everyone and looking around, sort of like a meerkat. It was so precious and sweet. My husband and I kept crashing and bumping into things, as well as caused numerous traffic jams in the isles because we couldn't stop staring at him LOL. Thank you Allah, for the sweetest little boy. Masha Allah what a sweetie!!! It's hard to believe that he is 7 months already!!! Thank you sisters for checking out my little monkey! He is truly, the greatest joy! Mash'Allah what a cutey-pie, I'm telling you, seven months has flown. You two are terrible, so loved-up you're hitting things with your trolley! Aaaaaaawwwww!!!!!! MaashaAllah. LMBO@ you and hubby bumping into stuff with the cart cuz u couldn't stop staring! Lower your gaze!!!!!! lol, just kidding! What a sweetie. Wow he is cute, I know I have a 2 year old and a 1 year old girls and is amazing how fast they grow and how everyday is full of excitment MashaAllah! I'm in Queens =) My daughters fine alhumdulillah. Shes actually taking a nap now while i cook dinner. (Tortellini with butternut squash sauce) ITS DIVINE!!! Awww sooo adorable!! mashaAllah. Just tooo Cute!!! that is so gorgeous mashallah! !